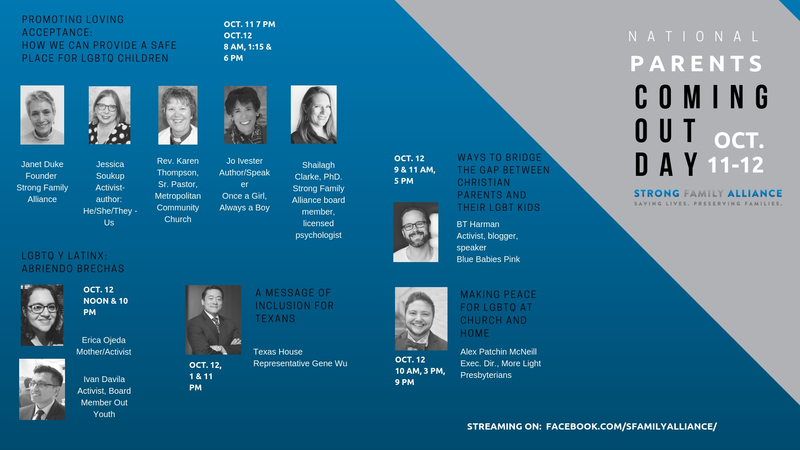 To celebrate NPCOD, Strong Family Alliance will host a series of online educational events with experts and leaders in LGBTQ advocacy, and resources and guides will be made available for families. In addition, Strong Family Alliance is asking parents of LGBTQ children to share the day on social media using #NationalPARENTSComingOutDay. Additional resources include Relevant LGBTQ Statistics, 10 Tips for Coming Out as a Parent of an LGBTQ Child and an opportunity for parents to share their story anonymously, to help them practice telling their experiences and becoming a resource for others. Nearly one in two Americans has someone close to them who is LGBTQ. Replay: October 12, 8 am, 1:15pm, 6 p.m.
Jessica Soukup, feminist, activist, LGBTQ speaker, and author of “He/She/They – Us: Essential Information Vocabulary and Concepts to Help You Become a Better Ally to the Transgender and Gender Diverse People in Your Life”. Jessica Soukup is an activist, writer and passionate advocate for intersectional feminism and equal rights for transgender and gender diverse people. She speaks publically on women’s empowerment, transgender rights and educates on LGBTQIA Allyship. She serves on the board for Campus Pride, The Central Texas Transgender Health Coalition, Queer Women in Leadership, and Pantsuit Republic. Jo Ivester, writer of the award-winning memoir “The Outskirts of Hope”, and inspired by her transgender son, she is now working on her second book, “Once a Girl, Always a Boy”. Jo is committed to advocating for equal rights for all. Her award-winning memoir about her family’s time in Mississippi, The Outskirts of Hope (She Writes Press, April 2015), has led to numerous speaking engagements about racial relations. In the last few years, Jo has broadened her focus to raise awareness about the transgender community. Inspired by her transgender son, she is now working on her second book, Once a Girl, Always a Boy. Through this and her speaking engagements, Jo shares the story of what is was like for her son to grow up in a world not quite ready for people like him. Rev. Karen Thompson, Sr. Pastor, Metropolitan Community Church Austin, Texas. A graduate of Austin Presbyterian Seminary, Rev. Karen began her journey to ordination as a Presbyterian. However, the Presbyterian Church’s refusal to ordain openly gay pastors at that time, combined with Rev. Karen’s growing desire to work in and with the LGBTQ faith community, led her to ordination in MCC. Shailagh Clarke, PhD, Strong Family Alliance board member, licensed psychologist. Dr. Clarke obtained her Ph.D. in counseling psychology at the University of North Texas. She completed a two-year postdoctoral fellowship in the psychology department of Texas Children’s Hospital, where she specialized in treating disruptive behavior and ADHD in children. Dr. Clarke has worked with adults, children, and families in a number of settings, including college counseling centers, hospitals, community agencies, and private practice. October 12 Live at noon, replay at 10 p.m.
Erica Ojeda is an advocate and activist. She is the mother of a transgender son. Ivan Davila, is a public relations and communications professional in the health services field. He is a strong LGBTQ advocate for youth and latino communities. He serves in the board of Out Youth Austin. Anjanette Gautier is an advocate, journalist, and public relations professional. She is a member of Strong Family Alliance. October 12, 9 and 11 a.m., 5 p.m.
B.T. Harman is a creative strategist, writer, and speaker living in Atlanta’s historic Cabbagetown neighborhood.B.T. Harman (formerly Brett Trapps) gives a poignant talk about coming to terms with being gay in a deeply religious community in the American south with a surprising realization about himself and the community. B.T. Harman left corporate America to pursue his dream of becoming a writer and storyteller. He shares stories of self-discovery and identity on www.BlueBabiesPink.com which is inspired by his experience of coming to terms with being gay in the American south. October 12, 10 am, 3 & 9 p.m.
Alex Patchin McNeill has served as the Executive Director of More Light Presbyterians since 2013.During his tenure at More Light, he has equipped congregations to live into policy change for inclusion of LGBTQIA+ people and has successfully enacted policies for marriage equality in the Presbyterian Church, USA. As an openly transgender man with a wealth of experience both professionally and personally, he is a sought-after trainer and facilitator of workshops on gender identity and sexual orientation. Alex is a Candidate for Ordination in the Presbyterian Church, USA, and holds a Master’s of Divinity from Harvard Divinity School, and a Bachelor’s degree from the University of North Carolina – Chapel Hill. October 12, 1 p.m and 11 pm. State Representative Gene Wu proudly serves the people of District 137 in the Texas House. Prior to being elected in 2012, he served as a prosecutor in the Harris County District Attorney’s Office, where he sought justice for thousands of crime victims. Gene is currently an attorney in private practice.Since being elected State Representative, Gene has authored legislation reforming the criminal justice system, decriminalizing truancy, enhancing Pre-K standards, strengthening protections for victims of human trafficking, and improving college readiness. He has been honored to receive recognition for his work by organizations such as Sierra Club, Equality Texas, and the Texas District and County Attorneys Association. Now in his third term, Gene has been appointed to serve on the Appropriations Committee and the Human Services Committee. Strong Family Alliance is a non-profit organization with a simple mission: to save lives and preserve families by supporting parents of LGBTQ children coming out. Strong Family Alliance gives parents accurate information, insights into family dynamics, ways to keep their child safe and healthy, and tools to help them lead with love and solve problems over time.